Hepatocellular carcinoma (HCC) is the third most common cause of cancer death worldwide accounting for more than 700 thousand deaths per year. Most of the HCC develops in a cirrhotic liver, a microenvironment where fibrotic tissue replaces parenchymal cells. Thus, there is a close connection between fibrosis and HCC development. Understanding the cellular and molecular mechanisms involved in this process is a crucial step to advance in novel therapeutic or pharmacological strategies to prevent or improve the course of this malignancy. A key molecular player capable of modulating cell growth and fibrosis is the Transforming Growth Factor-beta (TGF-β). Interestingly, TGF-β seems to act like a switch, since it has dual and opposite roles during early and late phases of cancer development. Therefore to develop therapies that target TGF-β signaling pathway for HCC treatment is important to understand the underlying pathogenetic mechanisms at play with special emphasis in the crosstalk between TGF-β and other signaling pathways. In recent years, a plethora of TGR-β have been developed and some of them are under clinical investigations for testing in patients with advanced HCC. In this review, we summarize recent knowledge about the role of TGF-β signaling pathway in HCC progression. Keywords: TGF-β, hepatocellular carcinoma, HCC, liver cancer, cirrhosis, pathogenesis. 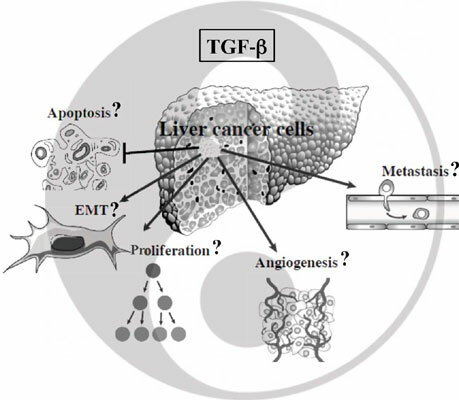 Keywords:TGF-β, hepatocellular carcinoma, HCC, liver cancer, cirrhosis, pathogenesis. Abstract:Hepatocellular carcinoma (HCC) is the third most common cause of cancer death worldwide accounting for more than 700 thousand deaths per year. Most of the HCC develops in a cirrhotic liver, a microenvironment where fibrotic tissue replaces parenchymal cells. Thus, there is a close connection between fibrosis and HCC development. Understanding the cellular and molecular mechanisms involved in this process is a crucial step to advance in novel therapeutic or pharmacological strategies to prevent or improve the course of this malignancy. A key molecular player capable of modulating cell growth and fibrosis is the Transforming Growth Factor-beta (TGF-β). Interestingly, TGF-β seems to act like a switch, since it has dual and opposite roles during early and late phases of cancer development. Therefore to develop therapies that target TGF-β signaling pathway for HCC treatment is important to understand the underlying pathogenetic mechanisms at play with special emphasis in the crosstalk between TGF-β and other signaling pathways. In recent years, a plethora of TGR-β have been developed and some of them are under clinical investigations for testing in patients with advanced HCC. In this review, we summarize recent knowledge about the role of TGF-β signaling pathway in HCC progression.